Catholic Bible ❤+❤ Which Version To Read? The Roman Catholic Bible is the Holy Word of God. Whether you're learning the Catholic catechism or simply reading the Bible, it is a joy to read the stories over and over. Reading the stories about Jesus helps us to love Him more. You can receive graces for reading the Bible, as with praying. Choosing to read the Catholic Bible helps you to learn the Catholic Faith and gives you graces just like praying does. You might be surprised that there is only one Bible approved by the Catholic Church. There are many versions, but the version that is strictly approved by the Church is the Latin Vulgate Bible of St. Jerome. What is the Vulgate? It is the official Latin Catholic Bible. Why don't we use it? Well, not all of us speak Latin. Enter the Douay. The Douay-Rheims Bible is the closest English translation to the Vulgate and has a long history with no revisions needed. Will the real Catholic Bible please stand? Catholic Missals quote the Bible profusely. Haydock Bible with Commentary and Prayer To The Holy Ghost. Kids, Ten Commandments, and Bible coloring pages. This is a treasure! We've used this audio Bible download to listen to the Douay and to help our high school children learn in Bible study class. You'll find that it can be so much easier for your children to stay focused when they can hear what they're reading. Also, it is a giant help for those high school students who are still timid with such words as Jerusalem and Capharnaum. The audio helps with tricky personal and geographic names that can be hard to pronounce. Why miss reading the Bible for fear of long foreign words? You will enjoy this excellent Douay-Rheims Bible recording because Ben Barnes does an excellent job of reading it and has a beautiful voice. Perfect for quiet and thoughtful study. This MP3 audio Bible download of both the Douay Rheims Old and New Testaments is also available in MP4 format (audio and visual) as recorded by Steve Webb! This MP3 audio Bible download of the Douay New Testament is also available in MP4 format (audio/visual) as beautifully recorded by Steve Webb! With the MP4 the text is on video, too. Read while you listen! This is a giant help with Catholic Bible study, high school, and Lenten meditation - listen as you drive or do light chores! Fantastic for high school reading and memorization. I love this MP3 or MP4 audio Douay-Rheims Bible. It has been a great read along for our high school students. The best Bible in English is the Douay-Rheims Bible. It has been used and approved by the Catholic Church for hundreds of years. The Douay has been the definitive Roman Catholic Bible for centuries, ever since the 1600s. Catholic hand Missals for the laity have used this version ever since they were introduced in the 1900s. The Douay-Rheims & Clementina Vulgata (has the Vulgate which is the Latin parallel to the English), the Haydock version, and the plain Douay-Rheims Bible are near equivalent "versions". the Haydock Bible with commentary from years ago. Lepanto Press has published the nicest presentation of the Douay-Rheims Bible. It is super well bound, lovely print, excellent maps and - get ready - beautiful line drawing pictures! You'll like their many excellent books for homeschool and reading. Tan Books has had a discerning selection of classic Catholic books and has the Douay-Rheims Bible without commentary. Mr. Thomas Aquinas Nelson (TAN) is the reason this Bible is in publication today. He has since sold his publishing company, yet it still has a well respected collection of good Catholic books, a Catholic liturgical calendar and Catholic homeschool books - especially old books by saints. Smaller Bibles are easier to carry while traveling. The white covers are nice for girls as Confirmation gifts or are nice to give at weddings. The black and maroon covers are handsome for both men and women which can be handy when several members of the household own their own Bibles. 3. 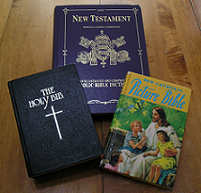 Which Is The Real Catholic Bible? I have never understood why there are different "versions" of the Bible. A Catholic Bible is the Word of God. How can there be different versions? The Douay-Rheims Bible has a wonderful history. It arose from the need to have a Bible that the English Catholics could read instead of what was being paraphrased as a Bible at the time. Why does an English Bible have a French name? Well, the clergy who put it together sure couldn't have done it in Protestant England in the 16th and 17th centuries. Catholics were prohibited from printing religious material in England during those days. Enter: the French colleges who were training the men from England who had vocations to the priesthood. Part of the Bible was translated in Douay and the other part in Rheims, France. When describing the Bible it is good to know the definition of the word. [The word "Bible" means "the book." In both the Latin and Greek languages the term "Biblia" is a plural noun and signifies "The Books." Originally, the Bible was not one book but a collection of books - in fact, a whole library. It was only in about the fourth century that the seventy two books of the Bible were combined to form the "volume." Eventually, the plural "Biblia" became a singular noun, and in modern languages signifies "the book." Mr. Nelson wrote a pamphlet explaining which Bible we should choose to read and explained many of the differences between different Bibles. He emphasized a basic point that we cannot change the Word of God. Any rewrite is a paraphrase at best. We are were sorry to learn that at one point TAN Books would no longer carry Which Bible Should You Read? by Nelson, Thomas A. published by TAN Books & Publishers Paperback. Perhaps you can still find it at Amazon. This next little book is an informative and hilarious read. It tells where we got the Bible and how the "books" came together after decades of there being no Bible for the "early" Christians. It's full of common sense facts and well documented sources. You can also learn the full list of books in the Bible in the booklet at Amazon Where We Got The Bible by Rt. Rev. Henry Graham at TAN Books. Why Use The Douay-Rheims Bible? As yo can see, when you're searching for a Roman Catholic Bible, you should get the Douay-Rheims Bible. It is the Catholic Bible with the longest history and the most recommendations. After having gone through Catholic high school and college, I had read Bible "versions" that were different from each other. What?! Isn't the Bible "the Bible"? In some of my own education I'd been through the Good News For Modern Man type schools that left me wondering what a paraphrase was if these weren't paraphrases. I had tried to read the Jerusalem, too, but by page 400 and reading many times that there is "a" God. It seemed that this must be a paraphrase, too. The indefinite article "a" did not express the truth that there is only one true God. How Do You Know Which Bible To Read? Beyond the notes above? Choose the one that preserves Catholic doctrine. How does one know? The first and easiest quote to check is Genesis 3:15. The Douay-Rheims Bible says "she shall crush thy head". A reason that paraphrased versions do not use "she shall" is that their authors chose not to tell the truth of Our Lady being the Mediatrix of All Graces, as her part in the Redemption is the greatest stumbling block to Protestants. St. Alphonsus Liguori mentioned this in his book, The Glories of Mary. and unisex language is used throughout as with many Confraternity for Christian Doctrine "versions" (CCD version). There is an interesting book called The Catechism of the Bible which describes in Lesson 16 the differences between the Roman Catholic Bible and Protestant Versions. It states that "The most notable difference is the absence of seven whole books and parts of two others from the Protestant versions. "They are called the Deutero-Canonical Books": "Tobias, Judith, Wisdom, Ecclesiasticus, Baruch, 1 Machabees, and 2 Machabees." "Many Protestant versions other than the King James omit the Epistle of St. James." (Faith without works is dead). Another important quote seems to apply to Catholic "versions" as early as the Confraternity of Christian Doctrine in the 1930s and 40s. It uses Anglicized words like "worship" rather than "adore" which concurs with the Latin read from the altar (and many others - testament/covenant, multitude/crowd, etc.) . You can see the root word for adore in the Latin even if you have not studied Latin. As with Protestant versions: "The King James version has a preference for words of Anglo-Saxon origin whereas the Douay version freely uses words of Latin origin...."
The Protestant versions removed many other Catholic beliefs by having removed the several books. Praying for the dead (Catholic doctrine on Purgatory) and nursing older children are in First and Second Machabees. Nursing your children and wondering how old? 2 Machabees 7:27 tells about the mother who was a saint and martyr after she watched each of her seven sons martyred. She fed her youngest son three years. Just a fact. St. Penelope had a similar story. The principle of non-contradiction is in force with many differing terms as can be seen between "she shall" and "he shall". If it is supposed to be "she", it would be contradictory to use "he". Other universal principles apply, too, like "No Catholic doctrine is ever outmoded!" Remember these thoughts when you find a discrepancy between "versions", then use another Catholic principle, "Always chose the better thing." If you have a Douay-Rheims Bible that has been faithfully produced (Lepanto and TAN Books), you can search and compare the verses to a Catholic online Bible. This means you can compare before you copy and paste notes, so you are sure of the version and do not have to scan or re-type long quotes into your own works. This Catholic Bible Online has the most beautiful words and makes research easy with its search functions and commentary from the Haydock Douay-Rheims. 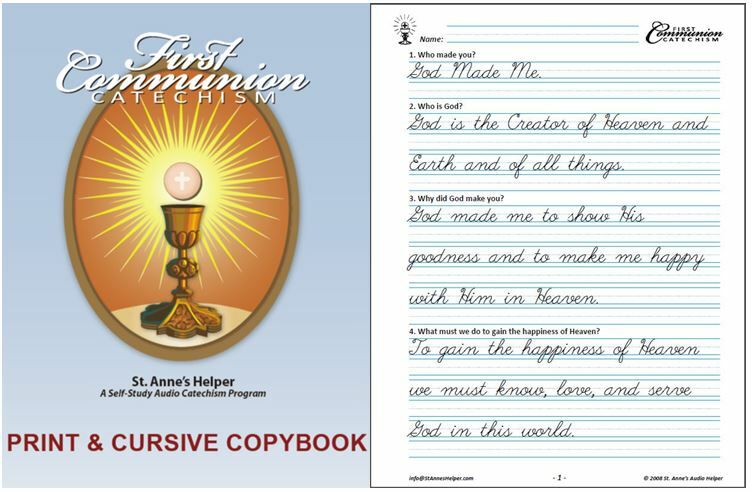 The original daily prayer book is the Roman Catholic Missal. It has daily Bible quotes all arranged to coordinate with the liturgical calendar. If you're using the Roman Missal of 1962, you'll have the correct Catholic feast days for the 1962 liturgical calendar. If you follow it every day through the year, you'll have read most the way through the Catholic Bible. The Catholic Douay-Rheims Bible has been the standard for English Sunday Missals or Catholic Daily Missals ever since hand Missals have become available in the twentieth century. Check here for some differences between Catholic Missals. 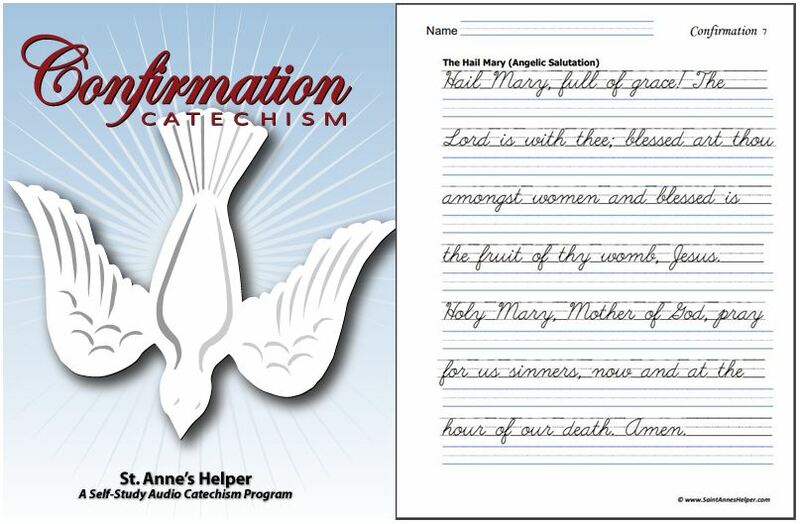 This catechism (By Rev. John O'Brien, M.A. New York 1924) is a Bible catechism that Catholics who choose the Douay will appreciate dearly. It teaches many reasons why the Douay is the Roman Catholic Bible. One special one is that the translation should use the Latinization of English words rather than the Anglicization as the protestants have done. Before I read this booklet, I did not even know that this was an issue; yet when I read my Latin/English Missal I see the difference quite easily. The Haydock Catholic Bible Online has explanatory notes. Since it is digital, it is so handy for use in copying long Bible quotes. Note Bene: Remember that most anything online is editable so one must beware the online editions, especially since OCR is not always very accurate if the information was scanned. To verify that what you see on the screen is a Catholic Bible compare to your book. Use these only as a tool and be forewarned that in "searching" for a Catholic online Bible we came across sites with very indecent advertising! As for the Haydock version: Did you know that Blessed George Haydock was related to the Fr. George Haydock who compiled the The Haydock Douay-Rheims Bible? Fr. Haydock's brother, Thomas, had run the publishing house in England that published it. All three lived under persecution. Blessed George was a "seminarian-priest" martyr. Fr. George and Mr. Thomas Haydock lived before the Catholic penal laws were lifted in the 1800s and together published and commented on what is called the Haydock Bible. What's special with the Haydock Bible is that it has explanations, cross references between the Old and the New Testaments, and commentary of the saints and doctors of the Church. Catholics needed these notes to defend against Protestant errors. Remember that the Douay-Rheims Bible was translated at a time when every word mattered to the point of martyrdom. 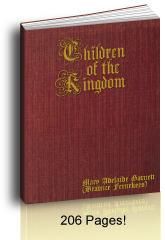 The Anglicans in England were ready to kill Catholics over such matters as true Catholic education as they did St. Margaret Clitherow. 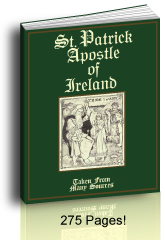 A great feature that the Haydock version has is its running commentary of Catholic saints and Fathers on the same page as the text which appear as footnotes. Both the Old Testament and New Testament have this commentary. This helps the reader understand the Catholic understanding of Scriptures, which is sometimes hard to "wrest"! The reprints of both the Douay and the Haydock Douay-Rheims Bible also have a mini Catholic dictionary. The Haydock Bible has a most beautiful pictorial Catholic Dictionary that is an unusually interesting feature that adds a great value to the book. There are also other appendices such as phenomenal pictures of Bible stories and there's a Bible history. Both the Haydock and the regular Douay are usually printed with a timeline history in the back. The New Regulations on Indulgences booklet from TAN Books says, that among the plenary indulgences that are left to us, there is a plenary indulgence for reading the Bible. 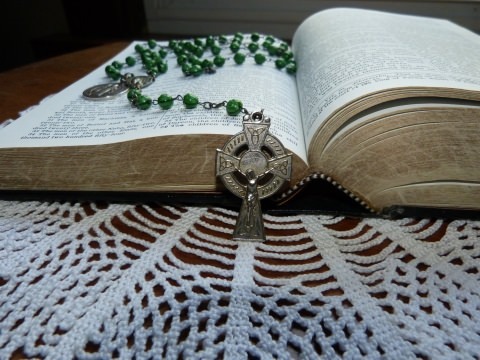 Since the word "the" is indicative of a particular single item it should be understood that one should use a Roman Catholic Bible so as to be certain to be studying or reading the whole Bible and nothing but the Catholic Bible! "Bearing in mind that only one of these plenary indulgences can be gained on one and the same day, a plenary indulgence can be gained under the usual conditions of confession (say every two weeks), Communion and prayer for the Pope's intentions:...."
"For reading Sacred Scripture with the reverence due to the divine word for at least half an hour, as spiritual reading" (p. 29, 30). Come, Holy Ghost, fill the hearts of Thy faithful and enkindle in them the fire of Thy love. Send forth Thy spirit and they shall be created. And Thou shalt renew the face of the earth. O God, Who didst instruct the hearts of the faithful by the light of the Holy Ghost, grant us by the same Spirit to have a right judgment in all things and ever to rejoice in His Consolation through Christ Our Lord. Amen. Which are the Catholic Ten Commandments? We also have Bible Story coloring pages. Remember that the Douay is on several audio formats, too. And here are some beautifully personalized Bible covers.